Please click here for the 2009-201 USA Hockey Rule Book and Case Book. Please click the hypertext for instructions on running the clock at Chiller North and Chiller Ice Works. These should also be at the rinks next to each score clock. here is some good information on concussion awareness and prevention. The 2007-08 season is well underway, and I'd like to let you know what's going on with the local Officiating Program. Along with monthly meetings where we discuss the playing rules, procedures and policies, we have implemented a Development Plan for all officials who referee youth games in Central Ohio. This plan is in its beginning stages and we will continue to monitor its effectiveness and continue to work as hard as we can to develop and train all of our officials from year to year. We have taken many of our senior officials to fill roles as evaluators, game observers and shadowers so that all of our officials can be coached throughout the season. We have also handed out steno pads to every new official and all Level 1 officials in our organization. 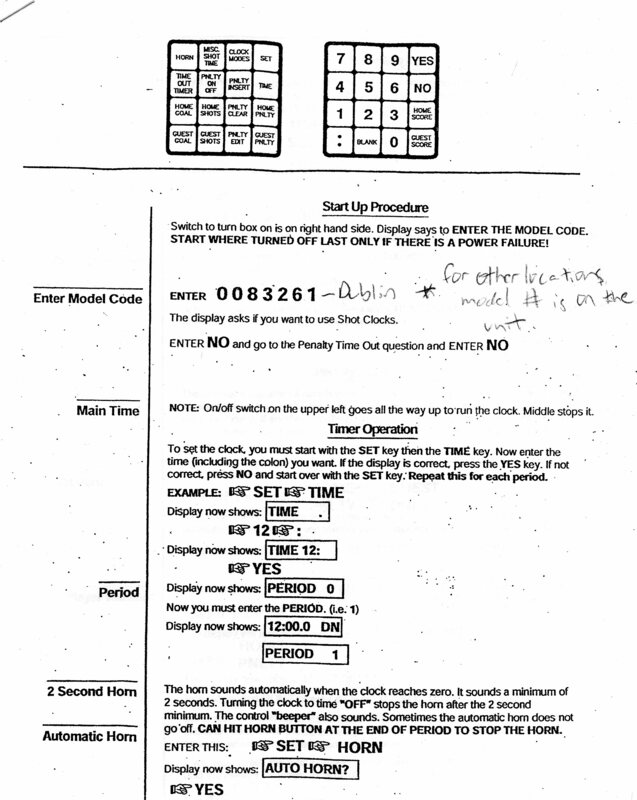 The purpose of the steno pad is to be a brief version of a full evaluation for our younger referees. When a steno pad is filled out by a senior official, there will be 3 things for that official to work on before s/he is evaluated again. The next senior official will then look at that steno pad and ensure that the younger referee worked on what s/he needed to and then will write down 3 more things to work on. This will continue for that new/Level 1 official all season long. We also have implemented a Mentoring Program that has 2 different ways of developing officials: Game Observing & Shadowing. Game Observing: The new/Level 1 official will arrive to the rink 1 hour before his/her game and sit with his/her partner and watch the officials work the game before their own. This will allow the senior official to really show the younger referee what the crew on the ice is doing correctly and what they can work on. These 2 officials will then work the next game and the steno pad will be filled out. Shadowing: A senior official will skate as a "third official" in lower level House games as a "coach" on the ice for the new/Level 1 officials. The Shadower will be in full referee gear, but will not be calling penalties or infractions as his/her job is to make sure the officials understand certain aspects of officiating. Being on the ice will allow the senior official to effectively point out some areas of improvement. This plan will be most effective with the help of not only the officials working games, but with the help of coaches, administrators, players and parents involved in youth hockey. It is exciting for us as officials to work with dedicated people like yourselves to improve the game from an officiating standpoint, and I hope that we will continue to move forward with the utmost regard to the improvement of the sport we love. All coaches, administrators and parents are more than welcome to join us at our monthly meetings to see what we do and to learn more about rules and procedures. 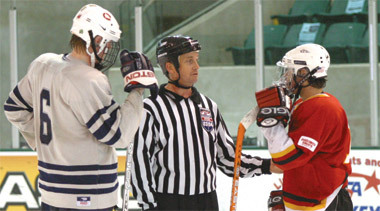 Please visit our website at: www.colsicerefs.com for meeting dates and more information about the Central Ohio Youth Ice Hockey Officials Association. And as always, if at anytime you have any questions/comments/concerns, please don't hesistate to contact myself or our Director (Gary Wilkins: ). I look forward to working with everyone of you for the rest of the 2007-08 season, and good luck to you and your teams! "; em="director" + '@' + em; ename="colsicerefs.com' face='Arial' size='2'>director@colsicerefs.com"; ename="<' + 'a href="mai' + 'lto:' + em + "?subject=" + '" title="Click to email this person">' + ename + '<' + '/a>'); ). I look forward to working with everyone of you for the rest of the 2007-08 season, and good luck to you and your teams! This video was given to me the other day and I thought it was worthwhile to share with all of you. I found a copy of it already on youtube, but if you would like a hard copy, let me know. It runs 9:03 in length. Talk is cheap, but a 10-minute misconduct penalty isn’t. Neither is a bench minor with the game on the line. Ask the most skilled bench bosses and they’ll tell you that proper care and handling of officials can go a long way in the course of a game or a season. Conversely, improperly relating with officials can backfire faster than a turnover in the defensive zone. When it comes to dealing with on-ice officials, one word can sum up the key to a healthy, and happy, relationship. “When coaches or players speak to me during a game, they do not want to know what I’m having for lunch. Nine times out of 10, it’s to discuss a call or non-call,” says Julie Piacentini, who speaks from both sides of this communication divide. Piacentini, a two-time Olympic linesman, currently officiates women’s hockey for the East Coast Athletic Conference and Hockey East. She also coaches the defending national champion women’s Senior A squad. “Respect” can be a broad and vague concept. But in a hockey sense, at least how it relates to referees, it almost always involves not attracting the attention of onlookers and not “showing up” the official. Sjoukje Brown-McCudden, seminar coordinator for the Illinois Hockey Officials Association, agrees that “equal footing” works best in the bench area. “If a coach wants to be taken seriously, he should stand at an even level with me — not with one foot up on the boards — use a conversational tone and listen to the answer,” she says. With many referees, the very beginning of any interaction should not be ignored. Addressing an official by name or by “sir” scores big points. Other forms of polite discourse are also encouraged. “For example, if there’s a disputed goal,” says Phil Lovecchio, former president of the Missouri Ice Hockey Officials Association. “[A player or coach] should ask politely if the referee has asked his linesmen or assistant referees for their views. It is likely that players and coaches do not consider body language to a great degree. But few aspects of a conversation, on or off the ice, are more important to officials who want to remain as low key as possible. “Tactics such as making gestures, swearing or name-calling will garner nothing but negative feedback from referees, and could get someone thrown out of a game,” says Brown McCudden. Few would connect “humor” with an emotionally charged or even potentially hostile meeting, but sometimes taking a light-hearted approach can go a long way. Something else that makes officials miserable is their own mistakes. And the smart ones are not afraid to “come clean” on this issue when speaking with players and coaches. “Referees err on calls just like coaches who may make a bad line change, or players who make a bad play,” says Piacentini. “I try to be honest and admit I didn’t see something. But even a backhanded compliment such as that has been known to do the job from time to time. Matt Nilles is a registered official in Urbana, Ill. Here is a great booklet on small area games you can use during your practices.